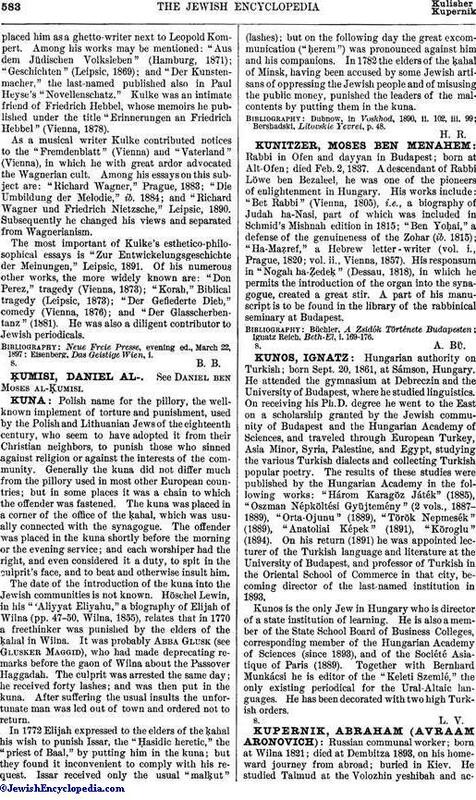 Polish name for the pillory, the well-known implement of torture and punishment, used by the Polish and Lithuanian Jews of the eighteenth century, who seem to have adopted it from their Christian neighbors, to punish those who sinned against religion or against the interests of the community. Generally the kuna did not differ much from the pillory used in most other European countries; but in some places it was a chain to which the offender was fastened. The kuna was placed in a corner of the office of the ḳahal, which was usually connected with the synagogue. The offender was placed in the kuna shortly before the morning or the evening service; and each worshiper had the right, and even considered it a duty, to spit in the culprit's face, and to beat and otherwise insult him. The date of the introduction of the kuna into the Jewish communities is not known. "Höschel Lewin, in his "'Aliyyat Eliyahu," a biography of Elijah of Wilna (pp. 47-50, Wilna, 1855), relates that in 1770 a freethinker was punished by the elders of the ḳahal in Wilna. It was probably Abba Glusk (see Glusker Maggid), who had made deprecating remarks before the gaon of Wilna about the Passover Haggadah. The culprit was arrested the same day; he received forty lashes; and was then put in the kuna. After suffering the usual insults the unfortunate man was led out of town and ordered not to return. In 1772 Elijah expressed to the elders of the ḳahal his wish to punish Issar, the "Ḥasidic heretic," the "priest of Baal," by putting him in the kuna; but they found it inconvenient to comply with his request. Issar received only the usual "malḳut" (lashes); but on the following day the great excommunication ("ḥerem") was pronounced against him and his companions. In 1782 the elders of the ḳahal of Minsk, having been accused by some Jewish artisans of oppressing the Jewish people and of misusing the public money, punished the leaders of the mal-contents by putting them in the kuna. Bershadski, Litovskie Yevrei, p. 48.